Hi foodies..today am going to share an easy fried rice with egg recipe. Fried rice is a Chinese dish of steamed rice that has been stir fried in a wok along with ingredients like vegetables, egg , meat and sometimes fish. 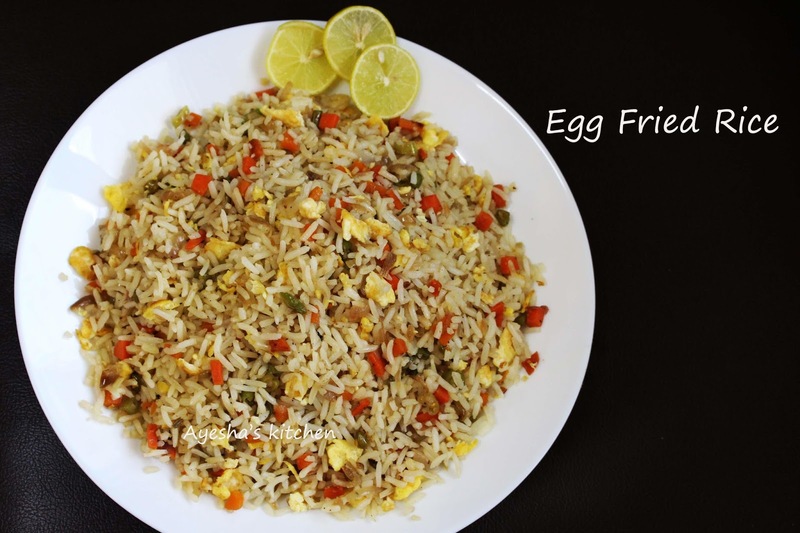 Egg fried rice is a variation of fried rice with egg which can be prepared in a jiffy if we have cooked rice already. 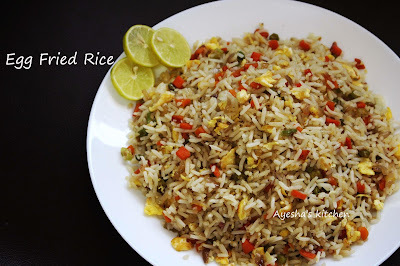 Just same as vegetarian fried rice recipe with an addition of scrambled eggs. Prepare the rice for fried rice ahead of time and keep refrigerated to make perfect fried rice ever. If you are looking for quick dinner ideas / kids lunch ideas, give this a try. You can either make this with left over rice or can use freshly cooked rice. You can add more or less of the ingredients to suit your taste. Hope you all like this egg fried rice recipe. So here is the recipe showing how to make fried rice with egg. Boil the rice in lots of water until 90% done. Each grain of the cooked must be separate. Drain it and Set aside. Let it cool completely. Whisk the eggs with pinch salt and pepper powder well. Grease a pan and scramble the egg well and set aside. In the same pan heat oil / ghee and saute chopped spring onion, garlic paste until raw smell goes off over a low flame stirring continuously. To this, add thinly sliced beans and saute for 2 minutes. Now add carrot chopped and cook for few minutes. When it is done, add soy sauce, pepper powder and salt. Combine very well over a medium flame. Add the cooked rice, scrambled egg , 2 tbsp of ghee and give a fine stir. Check for salt. Let it cook for 3 minutes on a medium flame , stirring occasionally. Serve hot with chili potato or cabbage manchurian or can serve with any pickle.